"Former California Supreme Court Associate Justice Cruz Reynoso, chair of the task force investigating the pepper-spray incident on November 18, 2011, said today the task force is working toward public release of findings and recommendations on Tuesday, March 6, at a time and location on the UC Davis campus to be determined. Additional information will be provided as soon as it is available." exposing the characteristic Y-shaped burrow dug by S. velum. For those who do not know, I got my first taste of microbiology research when I was an undergrad at Harvard and I did my senior/honors research project in the lab of Colleen Cavanaugh. Colleen studied (and in fact still studies) symbioses between invertebrates and chemosynthetic bacteria. The bacteria basically allow these invertebrates to function like plants in many ways. Some of these invertebrates (like the giant tube worms in hydrothermal vents) have lost their mouths and digestive systems and basically live by bringing in high energy chemicals for their symbionts which then make sugars, vitamins, amino acids and other goodies for the host. "... It is still tough for readers to discover new science ebooks. Traditional book reviews limit themselves to works on paper. Some ebooks may appear in computer magazines, but buried in reviews of laptops and printers. In between, we need a community. As we continue to build Download the Universe, we may change our minds about the scope of its mission. We can't say what those changes will be. We can only be sure they will be here before too long." This is just awesome news. The act was completely inane. Hooray for Open Access and Open Science and Openness in general. I saw (briefly) Larry Smarr today at a TTI Vanguard Conference on Hacking Life. I missed his talk yesterday unfortunately but after my talk today on microbes he sent me this article: The Patient of the Future - Technology Review. For those of you who do not know Larry, well, you should get to know him as he is a pioneer in getting to know himself. As background - I have known Smarr for about 7 years now as I have interacted with him over metagenomic analysis. If you want to know more about Smarr's background, well, it is amazingly impressive as all heck (see his Wikipedia entry for example). He has been a pioneer in computing, supercomputing, and engineering - and is a member of the National Academy of Engineering as well as the head of CaLIT2. Anywho, a few years ago Smarr had an epiphany of sorts - he became - well - a bit obsessed with his own personal phenotype. This came in part from medical issues that cropped up in his life but I am sure it also came in part from his nature. So rather than sit back and let the winds of general indifference from MDs knock him around, he decided to take control. And now he has gather more information about himself than virtually anyone on the planet. Over the years Larry has told me about some of his explorations of his own personal information. But I confess I was not really getting the point. But slowly I have come around to the notion. One thing that helped move me in this direction was when I went to a party for the release of Thomas Goetz's book "The Decision Tree." (I note - I also ended up losing a dollar bill to Jason Bobe - but that is another story). I got a copy of the book and read it - and this made me realize that technological advances - which are a big part of my work on microbes - are also making it easier for people to gather data about themselves. Goetz in the book discusses in part how technology can help enable people to engage more in decisions about their health by providing them with more information. And though I read Goetz's book it all still seemed a bit abstract to me. Certainly - more and more people were engaging in what has been called "The Data Driven Life" or the Quantified Self or the Measured Life. And on some topics I know people were recording information quite obsessively (e.g., about sleep wake cycles, or food consumed, or whatever). But what really opened my eyes to the whole notion was a meeting I had with Smarr about a year ago. I was in San Diego to give a few talks and participate in some meetings about "Beyond the PDF." And for my talk at UCSD I told my host(s) that I really did not want too many meetings - I just wanted to meet with a couple of people. And Larry Smarr was one of them. I had lunch with Larry and then went to his office where he showed me his data about himself. Holy crap. It was completely mind blowing. In a fascinating way. And a strange way. But more fascinating than strange. He had been ordering blood tests, and microbe tests and genetic tests and reading all the literature and then ordering more tests and recording his health status regarding all sorts of things. And this is when I think it hit me - this is real - this is about specific individual people. The data is not just a bunch of numbers that a scientist will use to do an in depth study of a person. This is a person doing an in depth study of themselves. Going back to the new article about Smarr - it discusses his continuing efforts to learn about his own medical ailments as well as predict and monitor his health condition. He will dig and dig and dig as much as he can - even more so than the last time I saw him. For more about Smarr and his self-data question see for example: How one quantified-self patient is working to transform health care and his website which has links to talks, videos, papers, etc. It is clear in this that Smarr is a pioneer. But he is not alone. Much more is coming. With electronic medical records, with cheaper and cheaper sensors, with better data storage and processing tools - many more people will do this. Of course, data is not knowledge. I see this issue every day in "metagenomic" studies and in the general and continued overhyping of genomics. But massive amounts of data gathered smartly and used smartly could really revolutionize medicine. Imagine if we all did this. Even better - imagine if we all did this AND shared the data. This notion is in part what the "personal genome" project from George Church is about. In that project people are releasing their genome data as well as personal medical data openly. But as far as I know the Personal Genome Project (PGP) is not driving the massive continuous collection of information about the participants in the way of Smarr. I note - after I saw Smarr in San Diego I began to move more towards sharing my own personal data and now, for example, have posted data to the PGP. Certainly there are challenges ahead. Privacy for example is a big issue. Target may be able to infer a lot about ones medical conditions from their shopping patterns, but using that information has risks. And of course, even if one is not worried about one's own privacy there are risks. Information about you can reveal information about others. This is obvious in terms of genetics - releasing information about yourself does reveal at least probabilities for your relatives. But it also is true for all sorts of other data. Your microbes for example, could say a lot about other people you interact with (consider the extreme - finding gonorrhea on ones skin ...). 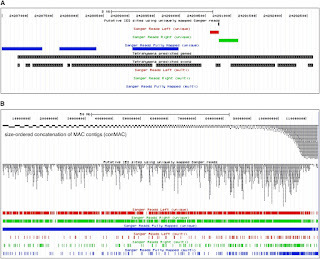 gene (A) and the rpoB marker gene (B). In the paper they test and use PCR amplification and pyrosequencing of the rpoB gene for studies of the diversity of bacteria. Due to the lower level of conservation of rpoB than rRNA genes at the DNA level they focused on proteobacteria. It seems that with a little perseverance once can get PCR for protein coding genes to work reasonably well for even reasonably broad taxonomic groups (not totally new here but I am not aware of too many papers doing this with pyrosequencing). Anyway, the paper is worth a look. Interesting piece by John Rennie at Smartplanet: What comes after antibiotics? Interesting piece by John Rennie at Smartplanet: What comes after antibiotics? | SmartPlanet. It discusses a variety of topics including antiomicrobial peptides, nanotechnology, Kary Mullis, Michael Zasloff, DARPA, Maryn McKenna, and more. Definitely worth checking out. 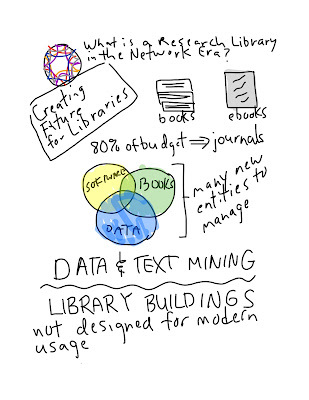 Here are some notes I took using my iPAD for a talk by Mackenzie Smith about libraries: Note Feb 21, 2012. She is a candidate for the UC Davis University Librarian position for which I am on the committee. This is the first time I have taken and posted notes from a talk using my iPAD - so please bear with me - it is an experiment of sorts. Note to do this I used an iPAD2, a Bamboo Stylus and the Notability App. I then exported to PDF and posted it (the Note above). For the images below I then had to export single pages to JPGs. If anyone knows an easy way to export a multipage PDF as a single JPG I would appreciate information ... Inspiration provided by Kosta. New paper in mBIO of potential interest from Lance Price et al. : Staphylococcus aureus CC398: Host Adaptation and Emergence of Methicillin Resistance in Livestock. For those not in the know, mBIO is a relatively new Open Access journal from the American Society for Microbiology. The paper discusses genomic studies of MRSA which has led the authors to conclude that antibiotic use in animals may contribute to the rise and spread of superbugs in people. From here. Maximum-parsimony tree of the 89 CC398 isolates (including ST398SO385) based on 4,238 total SNPs, including 1,102 parsimony-informative SNPs with a CI of 0.9591. Clades and groups of importance are labeled in a hierarchical fashion to facilitate description in the text. The tree was rooted with clade I based on an iterative selection process that identified this group as the most ancestral (see Materials and Methods). COO, country of origin; AT, Austria; BE, Belgium; CA, Canada; CH, Switzerland; CN, China; DE, Germany; DK, Denmark; ES, Spain; FI, Finland; FR, France; GF, French Guiana; HU, Hungary; IT, Italy; NL, The Netherlands; PE, Peru; PL, Poland; PT, Portugal; SI, Slovenia; US, United States; P, pig; H, human; R, horse; T, turkey; B, bovine; MET, methicillin susceptibility; R, resistant; S, susceptible. 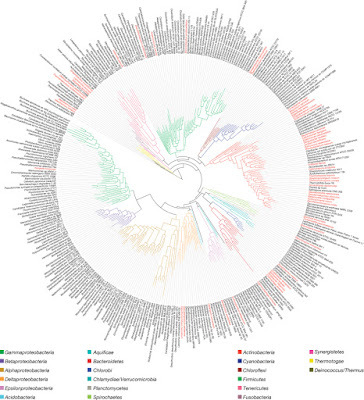 I recorded the audio of my talk on "Towards a field guide to the microbes" from the AAAS meeting on Saturday AM. Here is a slideshow of the talk with audio synched to the slides (I did this using Keynote on a Mac with the "record Slideshow" function). My slides from the talk are available at Slideshare. Just got this to post from my college colleague Jack Gilbert in regard to some comments he made to the press at the AAAS Meeting a few days ago. He sent this in part in response to some news stories that came out of the press conference we had at the meeting (e.g., see Florence Nightingale approach 'could help fight infection in ..., Open hospital windows to stem spread of infections, says ... and others). And I encouraged him to consider whether or not he needed to clarify some of his comments - and here is his response. (http://www.nature.com/ismej/journal/vaop/ncurrent/full/ismej2011211a.html) and asked them to discuss this with Jessica Green. Just received this in my email. As I have said before (The Tree of Life: How to stop press release spam? Post embargoed press releases) I am sick of getting unsolicited press releases that are embargoed and do not have any relevance to my work. They are SPAM. And to discourage this practice I am posting them to my blog when I receive them in order to break their embargo which I did not agree to. Please - all of you out there sending out unsolicited PR SPAM - stop it. Stop it. Stop it. Just received the three emails below regarding results of three UC Davis Faculty Senate Resolutions regarding the pepper spray incident from November and thought they might be of some interest. See this post for a little background. Much has been written recently about a call to boycott Elsevier due to their outrageous policies regarding academic publishing. I support the boycott but I also agree with many others who have said it perhaps unnecessarily singles out one publisher over others who also have publishing policies that could, well, use a bit of work. And one such publisher is AAAS - the American Association for the Advancement of Science. Today, the annual meeting of AAAS begins today in Vancouver. I was supposed to be there by now, but thanks to some technical problems at Alaska Airlines, I am back in Davis for the day. AAAS has some policies regarding openness that I believe are unnecessary and not in the general interest of scientific progress. One is the strange "talk embargoes" I have written about recently. Another, which is much more problematic, is the fact that Science Magazine (published by AAAS) does not deposit archival content in Pubmed Central. Now, mind you, I think all scientific publishing funded by taxpayer money should be openly and freely available immediately. But that is not going to happen immediately. One helpful tool in making scientific literature freely available is Pubmed Central. Most scientific societies I know of deposit published material in Pubmed Central after some initial delay of 3-6-12 months. But for reasons that are not entirely clear (to me at least, or to a Google search), AAAS clings to their archival material making it only available through their own web site. Sure - they do allow authors to deposit their version of their manuscripts in Pubmed Central after a delay. But most alas do not do this. And I note - this option is only open to NIH and Wellcome Trust funded work. So much material cannot be deposited anyway. AAAS's policy seems unnecessarily closed accessy and limits the impact and spread of the knowledge contained within papers in Science. I note - this policy is yet another reason to not publish in Science and to instead choose either fully open access journals or ones that at least release their stranglehold on the papers after a short delay. Today I call on AAAS to make archival literature from Science Magazine available in Pubmed Central. And I call on others out there, such as those at the AAAS meeting, to pressure AAAS to do this. Write blog posts. Call and email AAAS members and leadership. Email AAAS. And so on. Ideally everyone would just publish in fully open access journals and the journals would deposit material in archives. 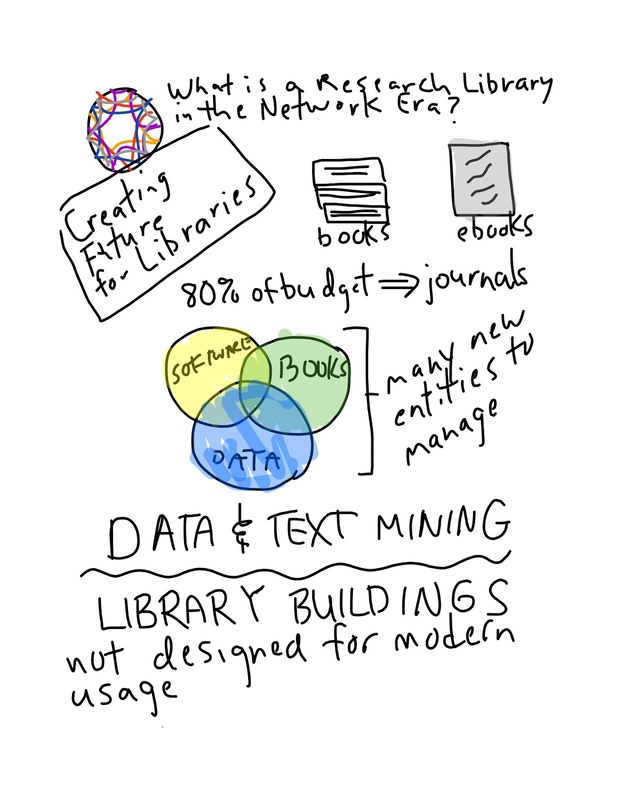 But until that happens, we need to make every effort to increase the amount of literature getting into Pubmed Central and other archives. So - pressure AAAS. And while everyone is at it, please deposit whatever you can in preprint servers, in various repositories and in Pubmed Central. Every little bit helps. "A prize is offered to the individual or team that can provide a very large, phylogenetically-organized set(s) of scientific names suitable for ingestion into the Encyclopedia of Life as an alternate browsing hierarchy. Names must be provided in Darwin Core Archive1 format. Extinct organisms may be treated but are not required. Ranks are not required for names but may be included. Internal nodes need not all have formal Linnaean names but require a label which can be arbitrary. Leaf nodes also need not have formal names but ideally most will overlap with current EOL species pages. For the purpose of this contest, metrics and source of node support, branch lengths, vernaculars, and synonyms are not required. These may be included; not all are currently displayable on EOL. Among other factors, the total number of uniquely named nodes, node/leaf ratios and tree height may be used to compare entries so contestants should consider how they wish to trade off strict consensus versus other methods of reflecting the state of phylogenetic knowledge. Problems to solve include 1) how to assign labels to unnamed nodes, 2) how to fill in gaps so that the set of taxa included is as comprehensive as possible, even if trees are not fully resolved or all taxa have not been analyzed, 3) how to handle competing hypotheses, 4) how to update the hierarchy at least annually. The winning submission must be available to EOL and others under an acceptable CC license if it is under copyright. The tree need not be previously published in peer-reviewed form. Questions about the challenge may be asked in the Phylogenetic Tree Challenge community on EOL." Earlier this AM I posted to twitter a brief comment about articles in Pubmed Central that reference Valentine's Day. The physician as erotomanic object. Just picked up this paper in one of my automated Google searches for, well, my own name: Prospects for the Study of Evolution in the Deep Biosphere. The paper is the result of a workshop I went to at the USC Wrigley Marine Station on Catalina Island. See my notes on the trip here: A "work" trip to Catalina Island: USC, Wrigley, C-DEBI, dark energy biosphere, Virgin Oceanic, Deep Five, & more. I note - the group of people at the meeting worked on their paper after the meeting and invited me to be a co-author on it. However, I was busy and I felt like I could not contribute to it in a way that would qualify for authorship. So I sent them comments here and there and had also given them some ideas while at the meeting. And now I am happy to report their paper is out. I never not previously paid much attention to the "Scholarly Kitchen" site before. Every once in a while I have noticed their posts and usually have found them off in some way. But then my brother Michael decided to respond to a recent posting from someone named Kent Anderson there. I wrote about this briefly here: Trolls and flames discuss #NotSoFunny satire at the Scholarly Kitchen. NI sequence coverage and phylogeny. They used a combination of a viral microarray and metagenomic sequencing to characterize viruses in various samples from patients with febrile illness. And they found some semi-novel viruses in the sample. Definitely worth a look. See some follow up discussion on Google+ here. Bit of a tiff going on over at the Scholarly Kitchen over a "satire" someone named Ken Anderson wrote related to the Research Works Act. The piece was about the "Restaurant Works Act" -- Someone pointed me to the post and I found the satire to be, well, unfunny so I chose to ignore it. My brother alas could not ignore it, nor could some others and there is some discussion going on there now. So - I have been enjoying all the Fake Scientific Publishing Posts on Twitter from @fakeelsevier @fakeplos @realelsevier @fakeeisen @closedaccessj and others. Now I understand why some people think I am behind some of these (e.g., here are some of my Fake Science News posts). But alas though I WISH I was behind some of these accounts, I am not. Anyway - I created a storification of the beginning of some of these postings if you want to see some of the origins of the fakery. MICROORGANISM microscopic plants and animals.They exist in soil for the purpose of breaking down organic matter into basic mineral elements.They include bacteria, fungi, actinomycetes, algae, protozoa, yeast, germs, ground pearls, and nematodes. Microbial community gene expression in ocean surface waters. Frias-Lopez J, Shi Y, Tyson GW, Coleman ML, Schuster SC, Chisholm SW, Delong EF. Proc Natl Acad Sci U S A. 2008 Mar 11;105(10):3805-10. Epub 2008 Mar 3. Hard to tell if this is a SPAM conference or not "4th Intntl. Science in Society Conference"
Hard to tell if this is email I just got is about a SPAM Conference or not. A new paper in which the lab was involved has been published recently (just found it though it is not in Pubmed yet): Genome-Scale Analysis of Programmed DNA Elimination Sites in Tetrahymena thermophila. It was a collaboration between Kathy Collins, multiple Tetrahymena researchers, the Eisen lab, and the UC Davis Genome Center Bioinformatics core (Joseph Fass and Dawei Lin). The paper is in G3, an open access journal from the Genetics Society. New publication from members of my lab and the lab of Marc Facciotti on a workflow for ChIP-seq based mapping of archaeal transcription factors. The paper includes a description of new software from Russell Neches in my lab called pique for peak calling. Russell's pique software is available on github here: https://github.com/ryneches/pique. The Pique software package processes ChIP-seq coverage data to predict protein-binding sites. 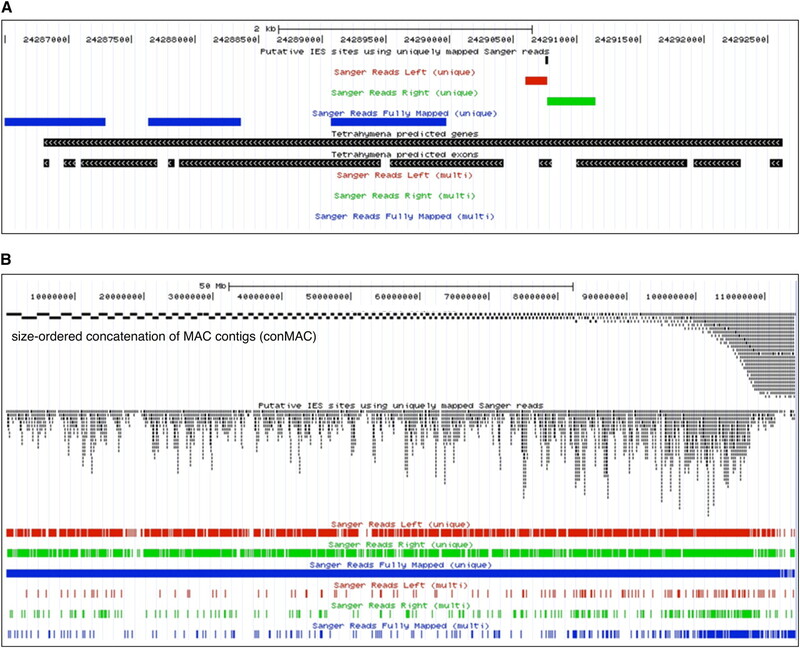 Strand-specific coverage data are output as tracks for the Gaggle Genome Browser, and putative-binding sites (peaks) are output as ‘bookmark files’. (A) Screenshot of data browsing in the Gaggle Genome Browser. Green box outlines the navigation window for clicking through bookmarks of predicted binding sites. Details of each site can be displayed (inset). The Gaggle toolbar (shown with black arrow) can be used to broadcast selected data to other ‘geese’ in the gaggle package, programs such as R, cytoscape, BLAST or KEGG. (B) Schematic overview of bioinformatics workflow. Just got this email below regarding the "New York Times Insight Panel." Seems like a scam to me. If it is real, then it seems pretty, well, lame. Anyone know anything about this? We would like to invite you to become a member of our community of engaged New York Times readers by joining The New York Times Insight Panel and sharing your opinions with us. And then Winter break happened and things calmed down a bit at UC Davis. Plus, I got busy and needed to go back to running my lab and doing some work. Not that nothing happened during this time. Lots did in fact. The best place to find out about what happened is the Davis Enterprise which continued coverage of everything going on (see list on the right side of this page). Catching up to today - now the issue (for me and other faculty/members of the Academic Senate) is that we have to vote on some resolutions regarding the pepper spray incident. Below are the three for which I am supposed to vote. I am asking anyone out there for input on these. All of them seem pretty, well, lame to me and I am inclined to vote no on all of them. But I am reserving judgement and looking for feedback from others out there. Any comments / suggestions welcome. Just a quick one here. There is an (openaccess) publication I thought people might find interesting: The origin of multicellularity in cyanobacteria. Schirrmeister BE, Antonelli A, Bagheri HC. BMC Evol Biol. 2011 Feb 14;11:45. In particular it has some very nice figures on phylogeny of cyanobacteria and the evolution of phenotypes in the group. Figure 1. Phylogenetic tree of 1,254 cyanobacterial species. Figure 4. Phylogenetic tree of a cyanobacterial subset. Evolution of cyanobacterial morphotypes: Taxa required for improved phylogenomic approaches. Schirrmeister BE, Anisimova M, Antonelli A, Bagheri HC. Commun Integr Biol. 2011 Jul;4(4):424-7. Epub 2011 Jul 1. Still wondering -can UC force me to sign "patent amendment" that is "not a change in patent policy" ???? Just got an annoying email regarding patents that is a follow up to one I wrote about previously (Wondering – can UC force me to sign new patent agreement?). I have appended the text of the email below. I am still wondering if the University of California can actually force me to sign this agreement. In addition, I am wondering about the competence and/or honesty of the people behind this amendment as it is pretty clear it is a major change and not as they claim in essence no change at all. If it is really in essence no change - then what is the point? If it is a major change why was there little if any discussion prior to the edict? I find the style and tactics of UC on this to be obnoxious and bullying. I fight for many many things for UC and UC Davis. Being bullied into signing a amendment that is claimed to not be any change even though it is clearly a big change - not something I can support. Here is the email, which I note, had as the header a big seal of the University of California - I assume to try and intimidate me into signing. OK I am now officially completely driven insane by email. As part of my attempt to reduce email communication with people I am going to start posting some of the emails I get often into FAQs. But alas, as a JPG when you zoom in you can't see the text very well. And about 30 or so people, maybe more, have asked for a higher res. version. Well, the simplest way to get this figure with legible fonts when zoomed in is to get the PDF of the paper and zoom in on it. But that may not be for everyone - so here is a link to the PDF of the figure that I posted on postures (Blogger does not allow PDF uploads). I also posted PDFs of the other figures. The paper describes the software "Zorro" which is used for automated "masking" of sequence alignments. Basically, if you have a multiple sequence alignment you would like to use to infer a phylogenetic tree, in some cases it is desirable to block out regions of the alignment that are not reliable. This blocking is called "masking." Masking is thought by many to be important because sequence alignments are in essence a hypothesis about the common ancestry of specific residues in different genes/proteins/regions of the genome. This "positional homology" is not always easy to assign and for regions where positional homology is ambiguous it may be better to ignore such regions when inferring phylogenetic trees from alignments. Historically, masking has been done by hand/eye looking for columns in a multiple sequence alignment that seem to have issues and then either eliminating those columns or giving them a lower weight and using a weighting scheme in the phylogenetic analysis. What Zorro does is it removes much of the subjectivity of this process and generates automated masking patterns for sequence alignments. It does this by assigning confidence scores to each column in a multiple seqeunce alignment. These scores can then be used to account for alignment accuracy in phylogenetic inference pipelines. The software is available at Sourceforge: ZORRO – probabilistic masking for phylogenetics. It was written primarily by Martin Wu (who is now a Professor at the University of Virginia) and Sourav Chatterji with a little help here and there from Aaron Darling I think. The development of Zorro was part of my "iSEEM" project that was supported by the Gordon and Betty Moore Foundation. Kudos to the UC Davis Bohart Museum of Entomology for the tour they gave to the Daisy Troop my daughter is in (which is run by my wife and a friend of hers). I got there a little late and embarrassed myself by thinking one of the dads was one of the museum workers and introducing myself (even though I know the dad pretty well). Oh well, live and let learn. The visit went great - the kids got to play with bugs, got to open the stacks and even pull out drawers of various bugs (note - the general term, not the Homoptera). The museum staff were wonderful and the museum itself is very nice. A great kids activity in Davis and good for adults too. Always great to see passionate science education and outreach. Just got pointed to this by Mark Martin. There is a new bill making its way through congress - HR 3433 - the Grant Reform and New Transparency Act of 2011. It has a subtitle apparently of "To amend title 31, United States Code, to provide transparency and require certain standards in the award of Federal grants, and for other purposes." The full text of the bill and other information is available here. I have not formed an opinion of the act but thought I would share the information since it does not seem to be getting much attention but seems like it could have impact. I note - one group that I respect deeply supports the act: the Sunlight Foundation which involves people like Ester Dyson and Lawrence Lessig. Any opinions or insight on the bill would be welcome.